We've started our 2D geometry unit in math this week. Today, when we were finishing up our journal entry, I had the students draw a picture that showed their learning for the reflection. Thought we had wrapped it up and all was good. And then, during recess, I remembered a fun art idea I had seen on pinterest for 2D geometry op art. So, we pulled out the paper and the markers and set to work. Students had to first draw a grid on their paper (they used pencil then went over it in marker). I then asked them to draw a minimum of 6 polygons on the grid (not overlapping the shapes). They then had to color in the grid (alternating squares for the pattern). I had them do all the squares for the grid first, then they had to go back and fill in the shapes - opposite to the pattern they did for the grid. There you go - it was quick and easy - and integrated math - and most of my students finished it up in one art block. Glad we squeezed it in today - it's been a bit since we got an art block in. So nice! I like how the shapes are "hidden" at first and you sort of have to find them in there. Fabulous! Definitely doing these after testing. My kiddos will love the creativeness, learning, and stress-free environment after the stressful mornings. Thanks a bunch! 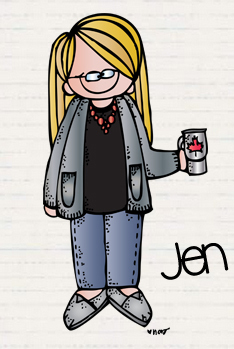 Love this Jen! So cool! Glad I found your site! I am a 4th grade teacher this year, but have been in 5th for about 10 years. Hoping to loop with my group. You have FABULOUS ideas posted. Thanks for sharing! Wow, a very creative and nice project!